Deciding on any home renovation project is going to cost time and money. So, you want to make sure that you really need or want to even do the renovation. 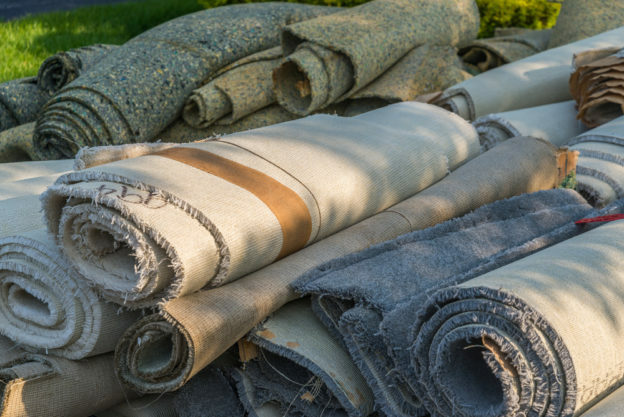 When it comes to old carpeting, you may be wondering when it’s the best time to replace. So, we’ve come up with five different reasons for removing old carpet. This way, you can determine whether or not it’s really worth the renovation you have in mind for your home. After a while, there is no telling all that your carpet is holding. Life happens, we get it. Spills, tracking in mud, and just life, in general, all take a toll on carpeting. But, after years, all of this life is going to start to show. And, while there are hundreds of carpet cleaners, rentable steamers, and even professional carpet cleaning services, sometimes, nothing is enough to make carpets look fresh again. So, if your carpets have gotten to the point where they are unmanageable as far as cleaning, it may be time to remove it and decide on an alternate solution for flooring. It’s obvious that with time, your carpets are bound to see a lot. This includes some wear and tear. While you can prevent certain accidents and even maintain carpets well with frequent cleanings, after 10 years, even with great maintenance, it will most likely be time to remove old carpeting. Again, there are cleaning solutions and professional cleaning services which may be able to take care of stains and smells, but these options don’t always work. Especially for stronger smells like pet urine and tobacco smoke. It’s often that individuals will purchase a home and find carpeting gives off a smell. If this is your scenario, chances are high that the previous owners attempted at removing old carpet smells before you purchased the property. So, removing old carpeting may be your only option at this time to get rid of the smell. >Carpeting is porous and can hold many allergens which may affect the health of your family. These may include mold, dirt, pet hair and dander, pollen, and dust. And, no matter how you may clean your carpet, it may still be affecting those with severe allergies. If your family is affected by allergies, you may wish to remove old carpeting so that your loved ones experience allergic reactions less frequently. For most, removing old carpet is a decision made based on aesthetic wants for a home. Carpeting just simply isn’t in style as much as it was, say 20 years ago. While it provides some benefits, it’s easy to see that tile, vinyl, and wood flooring are being used more in newer homes and home renovations nowadays. And, while other options are more popular currently, they are even easier to take care of. Rather than soaking up liquid like carpeting, tile, vinyl, and wood floors keep liquid puddled until you can clean it up. And, rather than needing vacuuming and routine steam cleaning, tile, vinyl, and wood floors only need sweeping and mopping. Now that you know the reasons for removing old carpet, you may want to go ahead with the flooring renovation process. At Dustbusters Floor Removal, we pride ourselves on removing all types of flooring, including carpeting. And, we do it all with our dust-free system. If you need professional help removing and discarding your carpeting, we can be in and out of your house in as little as a few hours! To get an estimate for your renovation, please give us a call today at 866-883-8783.